Our thanks to Mr Zachary Thomas for offering this excellent essay to NLM; it will be published in five parts over the next couple of weeks. Debates over ad orientem or versus populum worship often focus on the eschatological significance of the Eastward orientation, which is all fine and good. When the ecclesia orans faces East, the direction of the rising sun and the resurrection, we express the truth that the Church is not a community of this world, founded and maintained as an earthly structure with secular ends, but a pilgrim people “called out” by the Father, given life only in Christ, and directed towards His second coming, when our true nature will be reveal-ed at the end of time. The eschatological nature of the Church, however, which is manifested by the general Eastern orientation of the priest and people, is only one truth conveyed by the wealth of the Roman Rite’s symbolism. It is, of course, worthy of defense; indeed, one of the most important dogmas to recover about the Church after the rise of modernity, against the sociological conception of the Church so carefully critiqued by Pope Benedict. However, the conversation could be enriched by paying more attention to another aspect, the sacerdotal aspect of ad orientem worship. First, we have to admit that the ad orientem / versus populum debate is hampered right out of the gate by a false dichotomy. We phrase the question in a binary way, as if the priest’s facing statically one way or the other might more aptly express his priestly role. But this is, strictly speaking, incorrect. 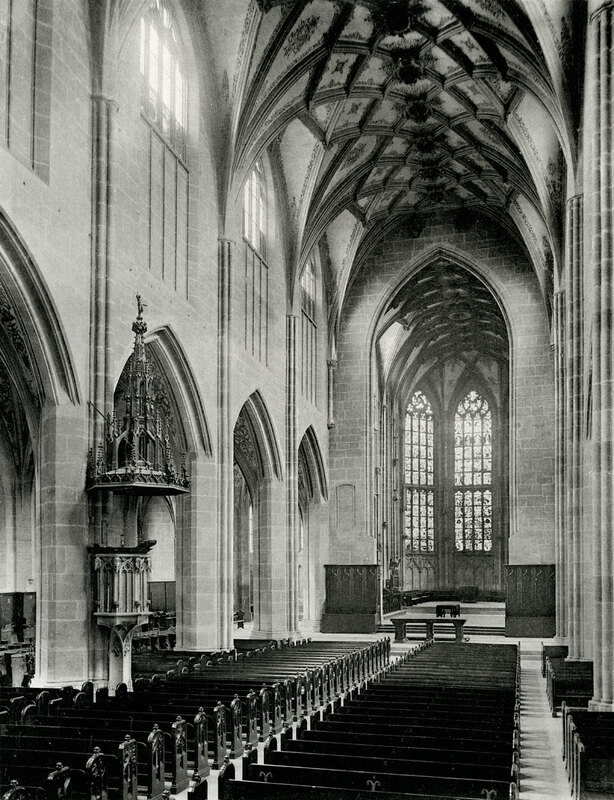 The real object of consideration should be the entire sacred choreography of a liturgical rite, the ritual gestures, symbolic actions, modes of walking, handling sacred objects, and inhabiting space that the whole group of sacred ministers carry out in a given rite: how ministers move to and fro, gestures of reverence, expressions of hierarchy. The ritual dances of the Ethiopian Orthodox, the coming and going of ministers around the Byzantine iconostasis, the angular movements and altar-centeredness of the traditional Roman rite, the circular stage-setting and openness of the new rite as commonly celebrated, are all parts of complex liturgical languages that carry meanings far more significant than written liturgical texts alone; in liturgy, the medium is the message. In this regard, debates over priestly postures need to widen their context. For example, listening to insistent calls for strictly ad orientem worship, we get the impression people want the priest always facing East. 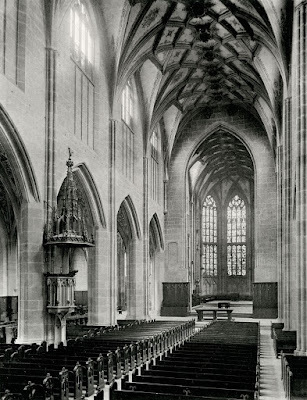 In reality, if the priest statically faced the altar and never turned toward the people, we might still have a problem: we may suspect he were some kind of proud spiritualist, a cold, posturing figure ascending to heaven and leaving the rest of us poor mortals behind. I think this is something like the mistaken impression of coldness some people get when they experience the old Mass for the first time, simply because the sight of the priest facing away from them at any time is shockingly foreign. Let’s take one example. In traditional liturgies, the priest repeatedly ascends and descends the altar of God, like the angels on Jacob’s ladder, returning to the people (after having climbed up from among them) to confer upon them God’s blessings, constantly and effectively implored at each holy sacrifice. In Eastern rites, the priest (or deacon) comes in and out of the iconostasis, vanishing from sight and reappearing to address and confer blessings on the ecclesia. Though modern churches built for the Roman rite lack iconostases, the rite has developed its own “sonic iconostasis” of silence, as Cardinal Sarah has pointed out. At various times the priest breaks out of this barrier, and turns around to bless (Dominus vobiscum) or to exhort (Orate Fratres) or to pardon (Misereatur vestri) or to proclaim (Ecce, Agnus Dei). Each time the priest turns around, it is (for one attuned to the rite) as if God has deigned to turn his face and look on us with favor and blessing. And each time he turns back to the altar, our hearts turn back to God with him as he leads us in prayer. In this way, the interior logic of sacrificial prayer is projected into the body language of the liturgical rite itself. The whole liturgical body—which is Christ—thus prays coherently with all of its senses; the body does what the mind thinks, and vice-versa. It is my contention that these traditional ceremonials, if you will the whole sacred choreography of the traditional rite, offers a more complete ritual actualization of the priestly role and thus of the nature of the Mass, whereas newer ritual fashions tend to obscure both. 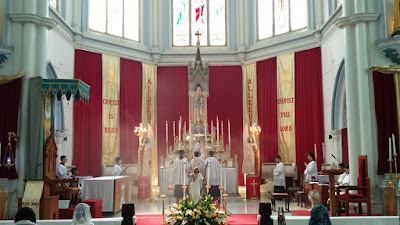 If the action of the Mass is the re-enactment of the drama of the Living Word, his incarnation and sacrifice and ascension, and thus a living, priestly action of ascending and descending, blessing and returning, then we desire a ceremony that physically embodies and existentially invokes these things as much as possible. Indeed, the reason we do ritual at all, instead of merely reading our Bibles, is to obey Christ’s command “Do this.” “Doing this” means entering into the sacrificial action with our whole being. It means entering the priestly posture. The “priestly posture” is most authentically understood in terms of Eucharistic and Trinitarian motion. The Trinitarian life is one of endless self-giving among the Divine Persons. Christ’s earthly life, itself a model of the eternal and ineffable life of the Trinity, is a constant self-emptying toward the Father in love. Becoming man so that man can become God, Christ invites us to enter through this sacrificial, Eucharistic economy into the life of the Trinity. Salvation means entering ever more deeply into that generous invitation through the person of Christ. It means molding our hearts and minds into a perpetual Eucharistic outpouring, through Christ, to the Blessed Trinity. We do this through a whole life of religion, but above all in the Sacred Mysteries, where everything works together to this end. 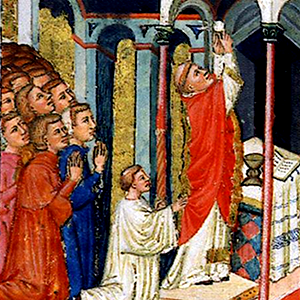 This grand mystery is richly symbolized in the old rite when, for example, the priest kisses the altar each time before turning to face the people, precisely to demonstrate that he brings blessing not from himself, but from the Holy Trinity, and through Christ’s sacrifice that gives us access to It. His constant orientation to the crucifix, the altar, and the East powerfully manifests the basic posture of receptivity and openness to a life that we must always humbly receive, never proudly grasp at or self-complacently enjoy. By contrast, if we honestly appraise the ritual language of the new rite as commonly celebrated, it is difficult to discern the logic of its motion, or its logic is often at odds with the nature of sacrifice. For one, with the removal of the prayers at the foot of the altar, there is little weightiness assigned to the priest’s going up the altar, little sense of grand purpose. Once there, after kissing the altar, he immediately leaves it and orients himself toward the people, to whom he speaks from beginning to end, in a closed circle. Thus, after his perfunctory ascent of the altar in the entrance procession, he never turns in a ritual gesture toward the Lord in the East, tabernacle, or crucifix. He never kisses the altar again until the very end of Mass. Each one of his ritual gestures, the bulk of his words, and his gaze, seem addressed to the people alone, even if his words are addressed to Another. When this ritual performance is combined with the lack of emphasis on sacrifice in the Ordinary and the new Proper prayers, one might get the impression from the ritual act alone that something has already vaguely happened, that salvation is something done and over with, now to be enjoyed and celebrated in the Christian assembly. After the opening procession, there is little motion or dynamism in the priest’s posture at all, except in verbal dialogue between priest and people. If the Mass is the “representation” of the sacrifice on Calvary—and thus of the Eucharistic/Trinitarian motion implied in it—then the new rites fail to convey the energy and orientation of this motion, they fail to surge forth with Christ from this world to the Father, aflame with the Holy Spirit. There simply is no convincing dramatic representation of Eucharistic, Trinitarian motion, even if it is not explicitly denied in the texts themselves. From a purely dramatic point of view, it is as if everything has already happened, is already in our possession, and must merely be “announced” or “proclaimed” or “remembered” again in the reduced modern sense of the word, rather than represented, reenacted, re-performed. There is little ritual urging to move past the present moment. 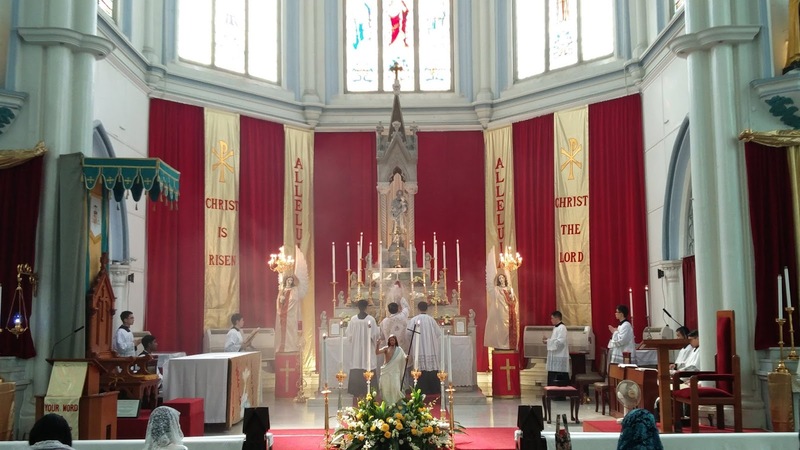 The altars were turned around in the first place so that the people could participate more fully in the action of the Mass, so that liturgy would not be only a clerical affair. Paradoxically, however, the understanding of the Mass’s action as it is conveyed in the new ritual prevents such participation in that action by eliminating consciousness of it. That is because the static versus populum posture implicitly denies the priest’s mediating role, and so obscures the Mass’s nature as an efficacious action. If the Mass is physically acted out as if it were only the “proclamation of the Word,” or “a communal meal” in which a past action is celebrated, and not the active, efficacious, dramatic re-performance of the act, its priestly character breaks down. The Mass is then reduced to a clerically imposed tyranny. “…although the new order in its Protestant variant seemed to correct this imbalance by denying the sacrificial role of the Protestant minister in favour of the communication of the word (and the assumption of the task of preaching and disciplining), nevertheless, Protestantism in abandoning the ‘middle voiced’ role of a mediating priesthood, abandoned also the mediating functions of a laity.... Since the new role of the minister was not to mediate but to announce an all-powerful sovereign word, the Reformation cast the laity as listeners to that word and recipients of the ministerial discipline. Here, the new modern active-passive framework without a true ‘middle’ was not a less but a more clericalized framework than before” (After Writing, Oxford: Blackwell 1998, pg. 145).